If you need a simple recipe to impress someone special on Valentine’s Day then this is the recipe for you! I couldn’t find the smallest size mozzarella balls they make so I sliced mine in half to have a better ratio of cheese to tomato to basil. Start by slicing the mozzarella balls in half if they are larger. Slice the grape tomatoes diagonally. Flip one of the halves around to shape a heart. 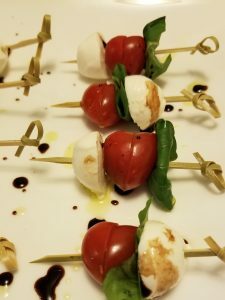 Skewer the grape tomato heart, one basil leaf, and half of a mozzarella ball. Repeat in any order you prefer till you have a full plate. 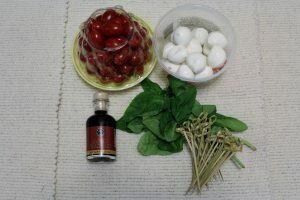 Assemble in a single layer on a plate and drizzle with balsamic vinegar and olive oil.